Thanks Christina. I’ve taken a lot of pictures this summer I just haven’t had time to share. The garden is overgrown and weedy but perhaps it’s made it even more attractive to insects and birds. I’ve never heard the name Blue Dasher. I’m glad one paused long enough for you to capture the picture. Hi Susan, it’s one of North America’s most commonly sighted dragonflies, but I personally haven’t seen all that many. This one was nice to cooperative while I tried for a photo. Such a pretty, magical creature. The wings are ethereal. 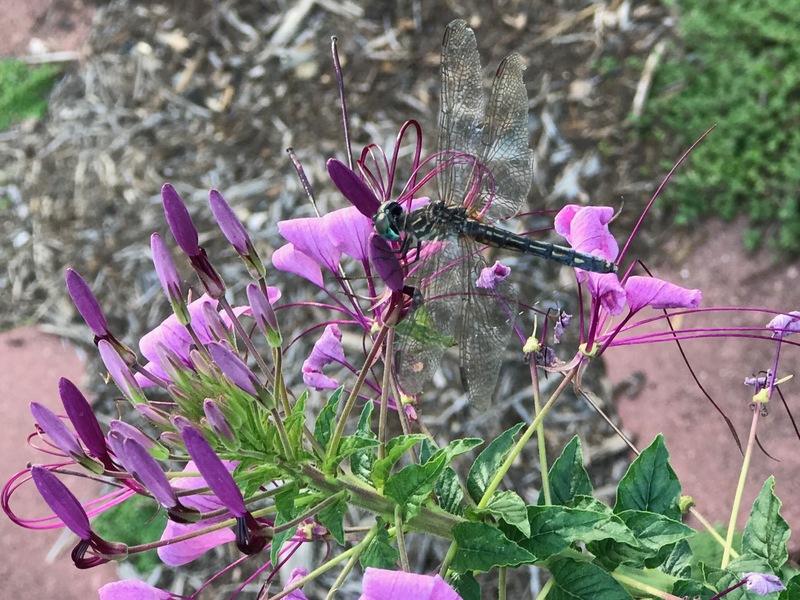 Kris, I only recognized this blue dasher because we had seen one at Meadowlark Gardens. WOW! I actually gasped when I saw this picture. Great shot! Great reaction Jason–thanks. Dragonflies don’t need more dressing up but this one did seem to be in costume.